AIMARETTI SPA, Hús- és hentesáruk, Hús és húsáruk, mélyhűtött, pork processing, az EUROPAGES oldalakon. 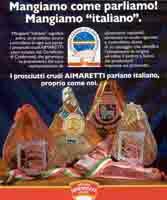 Aimaretti is a company that slaughters fresh, natural pigs applying the strictest hygiene and health standards. Some of our products include: fresh pork, frozen pork, sausages and spicy sausage, San Daniele ham, Parma ham and Italian hams without marking, zampone, mortadelle, cotechino.